Alex: I said go away. Meredith: You left the door unlocked. That's bold. Permalink: I said go away. You left the door unlocked. That's bold. Owen: I came back in one piece. I have both arms, both legs. Lots of other guys came back with real injuries. The worst I have is a couple of night mares or freezing for a moment. Derek: Is that what happened last night? You had a freezing moment? If you want, I can help. Owen: Yeah, I'm not the one who needs help around here. I'm not the one who cut out half a woman's brain and ran off to hide. I'm not the one who half this hospital is talking about behind their backs. So maybe you should spend a little less time worrying about me, and you know just take a look in the mirror. Alright. Derek: You know they're doing tests that show faltered brain anatomy in patients with PTSD. They're actually getting close to understanding the physical side of the psychological trauma. It's amazing what you can see with an MRI. Owen: What did Meredith tell you about last night? What did she say? Derek: Post traumatic stress is a real injury Owen. It can be healed. There are resources, MED centres, therapy. You shouldn't try an handle this on your own. Cristina: Swinder has no vision. Meredith: He wrapped his hands around your throat this morning and you're pretending like nothing happened. Cristina: Just focus on Izzie. Cristina: So like if he had a heart attack, or a stroke or lost a leg would you walk away? So how is it any more acceptable that I walk away from this? He's wounded. He has war wounds Meredith. It's not cut and dry. And it is not as bad as you think it is. Callie: Is she doing ok? Meredith: Ah yeah, well she says she is. Callie: Do you believe her? Alex: Chief, you paged me? Richard: Oh, Karev. Yeah, yes I did. Um, as you know we're gonna be harvesting eggs, from Stevens. Who I believe is someone you're having relations with. Richard: Frozen eggs have a better survival rate when they're fertilized. Alex: Give me the cup. Alex: Just give me the cup. Derek: Karev, I just reviewed Izzie's most recent MRI and it doesn't look like the tumors grown since her last scan, so that's good news. Do you have an questions or concerns that you'd like to discuss with me before we brief Izzie? Alex: Just try keeping her frontal lobe inside her skull this time. Bailey: Ok, as you know you have stage 4 metastatic melanoma. You have a lot of surgeries, and a lot of procedures lined up for you over the next few weeks. 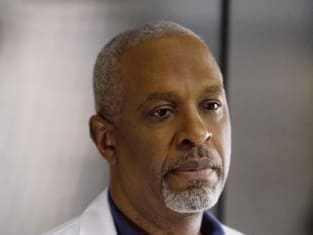 Richard: We've seen evidence of METS on your liver, so one of those surgeries Dr. Bailey and I will resect them. We also lined up Dr. Parker from OB to harvest as many healthy eggs as she can before you undergo any radiation. Bailey: Just leaving the option open for you if you want it. Derek: But our priority today is to address the temporal lobe METS on your brain. I'm surprised we didn't catch it sooner. This kind of thing can cause headaches, seizures and intense hallucinations. But, hopefully the legion has a clear margin so I can remove it all. Permalink: Great, lets get started. Ah, you three. Ok. Yeah, I understand why you're here. I know you wanna help, but I will be the resident on her case today. I will be prepping her for surgery, and if you are going into that hospital room today you will do so as her friends. Izzie needs her people around her. She needs you to tell her everything will be fine, she needs you to hold her hand. She needs you, not more doctors. Understood? Callie: George, hey. I'm surprised you're not, I mean... isn't there a big presentation happening with Izzie? George: I didn't even know she was sick. Bailey told me after Cristina told her. Izzie trusted Cristina. I was the very last to know. George: I don't really wanna talk about it any more. What I wanna do is work. Do you have any room on your service? Callie: Ah yeah. I have 3 hip replacements, and a tib fib repair. Meredith: You're wearing a turtle neck under your scrubs. It's ugly. Not as ugly as the fact that you hugged him. You hugged him. Cristina: I get it. I hear you. Lets move on. Meredith: Turtle necks aren't ok. You're not ok, and your boyfriends not ok.
Alex: Is your boyfriend ok? Alex: To be cutting into brains today. Is he ok to be back? Meredith: Yes. Of course. Derek is fine. Alex: I was there for his carnage in the OR remember? This isn't just any patient today, this is Izzie. Doesn't matter how tough we are, trauma always leaves a scar. It follows us home, it changes our lives, trauma messes everybody up, but maybe that's the point. All the pain and the fear and the crap. Maybe going through all of that is what keeps us moving forward. It's what pushes us. Maybe we have to get a little messed up, before we can step up. Derek: Hey. Come on in. This is a CT of Katie Bryce. 16 year old female, subarachnoid aneurysm. Meredith: From a fall during rhythmic gymnastics. I remember. Derek: I remember, it was the first surgery we ever scrubbed in together on. Our first save. Right here is a cerebral cyst. Tough save, but we did it. I kissed you in the stairwell after the surgery. And this right here is where Dr Bailey kicked you out of the surgery, because she caught us in your driveway, in my car. And right here, this is a seven hour craniotomy. You held the clamp the entire time, never flinched. That's when I knew you were gonna be an incredible surgeon. Beth Monroe, made our clinical trial a success by surviving. You talked me into putting her under. That's when I knew I needed you. And this is today, post op head CT of Izzie Stevens. You see that? Right there. Tumor free. Because of you. You got me into the OR. If there's a crisis, you don't freeze, you move forward. You get the rest of us to move forward. Because you've seen worse. You've survived worse, and you know we'll survive too. You say you're all dark and twisty. It's not a flaw, it's a strength. It makes you who you are. I'm not gonna get down on one knee, I'm not gonna ask a question. I love you Meredith Grey, and I wanna spend the rest of my life, with you. Meredith: And I wanna spend the rest of my life with you.